Adaptive hydraulic struts, auto-leveling and ht. adjustableHydraulic semi-active struts severely reduce body roll in turns and can be used to adjust the ride height. Hydraulic semi-active struts severely reduce body roll in turns and can be used to adjust the ride height. 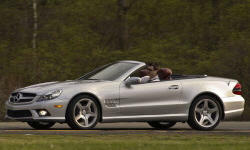 None of our members have yet commented on the available features of the 2009 Mercedes-Benz .